UPDATE: Wharfedale celebrates 80th anniversary with new Denton speaker | What Hi-Fi? 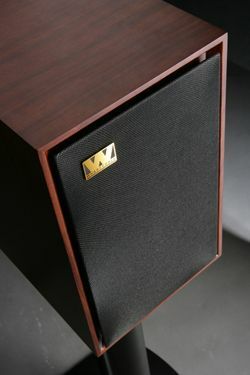 Wharfedale has confirmed the UK price of its Denton 80th anniversary speaker at £499.95. It will be available from July in "strictly limited" numbers and will be finished in a mahogany wood veneer. Design highlights include a 'sandwich' construction of wood materials to reduce panel resonance, a deeply inset front baffle, rear-firing twin reflex ports, offset biwire terminals and a crossover based on Linkwitz-Riley filters. Wharfedale also says the main mid/bass unit's chassis has been enhanced with a very large flange secured using six screws for maximum stability. Further details in our original news story from the Bristol Show below. Wharfedale – founded in 1932 by Gilbert Briggs – is celebrating its 80th anniversary with the launch of a new version of its original Denton standmount speaker. Although the new model has the traditional looks of the original, with a mahogany wood veneer finish to the chipboard cabinet and a Tungsten cloth grille, Wharfedale says it's very different under the skin. The bass unit features a woven Kevlar cone mounted on a rigid die-cast chassis, while the high frequencies are handled by a woven textile soft-dome tweeter with high flux ferrite magnet (rather than Neodymium). Peter Comeau, head of acoustics at Wharfedale's parent company IAG, says: "In voicing them, I had in mind the original Dentons, which sounded musical but with a touch of warmth. The ferrite magnet tweeter gives a cleaner, softer, smoother treble than Neodymium designs." The 80th Anniversary Wharfedale Denton will be available in May for "less than £500".